The new Disneyland in Shanghai doesn’t open until June 16th, but we’ve got a new drone’s-eye view of the progress at the new park. 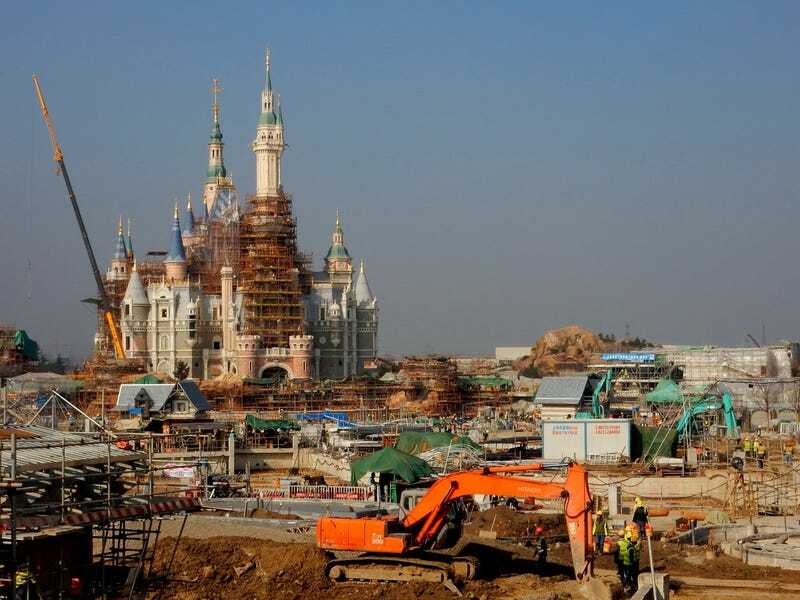 It will be the first Disney park in mainland China, and we can expect three things from it: It’s going to be busy; it’s going to have some cool new rides; and it’s going to make Disney a ton of money. Below, we see a map of Disneyland Shanghai with each of the new lands, including “Mickey Avenue,” a space known in Disneyland California as Main Street USA. As any Disney nerd knows, the opening of the original Disneyland in 1955 was kind of a disaster—a disaster televised on live TV, no less. With any luck, things like the water fountains and pavement will be functional by opening day in Shanghai. This is Tomorrowland, which will house five main attractions: Buzz Lightyear Planet Rescue, Jet Packs, Star Wars Launch Bay, Stitch Encounter, and the crown jewel, TRON Lightcycle Power Run. We’ve seen the TRON attraction’s concept art, and it look like it’s going to be a lot of fun. The ride vehicles appear to put you in the position of riding a real lightcycle, as you can see from this preview event back in July. This is the Seven’s Dwarfs Mine Train in Fantasyland. A version of this attraction is already at Walt Disney World in Florida, but it’s a safe bet that the new one will have at least slightly different features. Fantasyland will also include Peter Pan’s Flight, a suspended-track ride in both Disneyland California and Disney World which should be pretty impressive, if the latest suspended carriage tech is used. This is Treasure Cove, the home of attractions like Pirates of the Caribbean, and the pirate-themed live stunt show Eye of the Storm: Captain Jack’s Stunt Spectacular. The stage show renderings from Treasure Cove look pretty humble. But if the actual new Pirates ride is anything like the illustrations, it’s going to be heads above California’s version. No word yet on if they’re getting a robo-Johnny Depp. This appears to be the Voyage to the Crystal Grotto attraction just behind the castle. The rendering makes it look like an open-air boat tour, and one you’ll want to take in at night. We don’t have great aerial views of how construction is going on the Roaring Rapids side of the park, but if this rendering is any indication it’s going to be an exciting ride. Renderings are always more impressive than the real thing, but provided they get everything done on time, this is going to be one hell of a park. And, of course, we can’t forget the Star Wars Launch Bay. There doesn’t appear to be a massive expansion of Star Wars attractions at Disneyland Shanghai like we’re seeing in California and Florida. But that might have something to do with the fact that theme parks are planned out years in advance and Disney’s purchase of Lucasfilm was probably just a twinkle in Walt’s cryogenically frozen eye. Even the Marvel rendering looks kind of pathetic with just stanchions and a presumed meet-and-greet with characters. Personally, I’d take badass dinosaur monsters on Roaring Rapids over meeting some guy dressed as Hawkeye any day. I don’t expect to be able to visit Shanghai Disneyland anytime soon, but with brand new rides like TRON and Roaring Rapids, along with updated versions of Pirates and Peter Pan, this new park is probably going to be a huge success for the Mouse House.